Why are handmade items more valuable? There are plenty of vessels on the water at any given time, but only a few are genuine floating pieces are art. Marine carpentry is one of the main ways you can turn your vessel into a living space crafted just for you. Your needs are important, and with a professional marine carpenter, you can have your vessel adapted to your specific needs. But why, is custom marine carpentry so desirable for yachts and watercrafts? 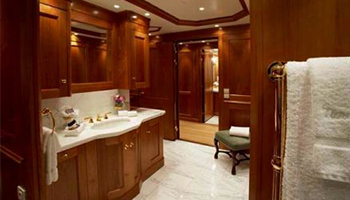 In this blog, we will discuss the incredible benefits of custom woodworking, specifically in a marine vessel. Here, you will hear the reasons why custom, handmade items are so much more valuable and aesthetically pleasing than conveyor belt-made installations. Creatively made with you in mind. Custom work will typically be made with the owner or customer in mind. That means that your specifications are always accounted for, such as the type of material, the size, the color, the finish, and even the deadline that you would like it completed. Having items made to your specifications can make the product that much more valuable to you. And, in marine carpentry, every item is crafted to look stunning and intricate. Custom-made items have a unique attention to detail. Custom-made items have the ultimate challenge; achieve perfection while making it look effortless. Professional marine carpenters must craft wooden items with such precision that it is difficult to imagine that a machine didn’t manufacture them. This obviously is an incredible challenge, as human beings are naturally flawed. But, with the right team of custom carpenters, any product can look like perfection. More importantly, custom-made items are crafted to be detail oriented. That means if you would like to add texturing or even designs to your wooden products, custom carpentry can handle those types of requests. Custom marine carpentry is meant to craft items that are unique, as well as detail oriented. If you believe your vessel could use some personalized craftsmanship, custom carpentry is ideal for you. Handmade items cannot be duplicated. There is something special about being one-of-a-kind. Just like no two people are alike, no two custom carpentry projects will turn out the same. This means that when you commission a custom carpentry project, what you receive is one-of-a-kind and is unique to only your vessel. Having something that no one else has makes your items that much more valuable, especially when manufacturing companies can create thousands of the same product. With a custom carpentry project, you can rest assured that your items are unique to you, and only you! Every time an item is custom crafted, it is made with a sense of creative spirit. It takes a skilled craftsman to see a piece of wood and carefully transform it into a finished product. Custom carpentry can showcase creative spirit, while manufactured items will always fall short. Machines don’t need patience or skill to complete their product, they just fulfill their duty and craft what they are programmed to do. Many human beings can recognize the value in creation and creative spirit, especially when they take into account the time needed to finish a worthwhile piece of carpentry. Because of the incredible difference between an emotionless machine and a professional carpenter, custom-made items are more valued and appreciated. Handcrafted means you know how it was made. Many times when you are buying items you won’t always know where they are come from. You might assume that they were mechanically constructed in some warehouse in an unknown location, but you won’t always know for sure where your items have come from. 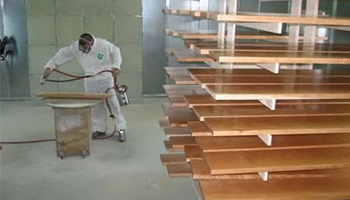 With custom carpentry, there is no unknown information about the products you receive. All items are made by a skilled craftsman in a Miami workshop. So, you never have to question the methods in which your products were made. And, by having your items made at Dennis Boatworks, all items are handcrafted and American-made. 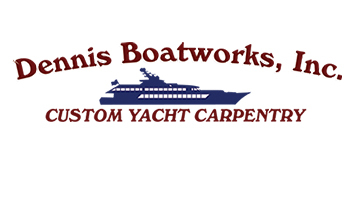 Dennis Boatworks is here to offer you premier marine carpentry services. 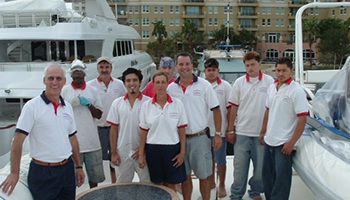 Whether you manage a small vessel or a yacht, our carpentry crew can work diligently to ensure your satisfaction. Dennis Boatworks prides itself on delivering quality work time and time again. If you are interested in our services, please contact us today. We look forward to serving you.